Ilyena Faustin (Russian: Елена Фаустина, Elena Faustina) is the wife of Mikhail Faustin and mother of Anna Faustin. She first meets Niko Bellic whilst he works for her husband. She has a small conversation with Niko while he's waiting for Mikhail. Ilyena tells Niko about Mikhail and herself before they came to the city and tries to understand how and why Mikhail had changed from the kinder man she first knew. Later, after Mikhail's death, Niko can find her at Firefly Island and she asks him to see Anna's new boyfriend, who is trying to convince her into becoming a stripper. 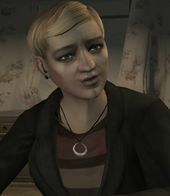 Niko can either kill Anna's boyfriend (resulting in an angry phone call from Ilyena, scolding Niko for bringing another man to a violent death), beat him up (resulting in a friendlier phone call from Ilyena), or let him escape (resulting in a sad call from Ilyena; her daughter has run away and she has no family left at all). Ilyena's vehicle of choice is a white Imponte DF8-90 with black roof. She is voiced by Marcy Maguigan. As shown in Rigged To Blow, she is very spiritual. However, Mikhail is likely an atheist and berates her by saying "Your God doesn't love you, you superstitious old crone!". If the player looks more closely to Ilyena's face, a black line on her cheek can be seen. This is because she cries a lot, which causes her eye make-up to melt. When Niko meets her in the random encounter, she moves for a kiss on the cheek, but Niko backs away, probably due to his guilt over killing her husband. Ilyena's sub-mission can be difficult, if not impossible to complete if police witness Niko trying to beat the guy up, as a 2-star Wanted Level is applied. Recommendation is not to attempt this mission with a vehicle you wish to keep or without having saved recently, as the likelihood of being wasted or arrested is high. Ilyena and her husband Mikhail's portrait in the living room of the Faustin mansion. This page was last modified on 4 November 2014, at 04:31.